Andi B. Goode: Not a Tutorial, Really. A few of you were interested in seeing a hair tutorial from me. Now, this is not a tutorial but I took some photos of what my hair looks like for its usual set - for example, this is how it might turn out. This is actually the set I did for Friday night but it didn't dry properly so it dropped more than it usually does. All of the rollers are rolled under and there isn't any set pattern to them. I'm also going to admit something - I am incredibly uncoordinated and lazy and, most often than not, my mum puts the rollers in for me! I like to think of her as my personal stylist. I put setting lotion onto my hair when it's dry - I do this because my hair holds a lot of moisture and my hair will not dry if I put setting lotion onto damp hair. I use Power Surge by Natural Look because it’s practically the only one I’ve been able to find to buy in Adelaide so far! Plus, it’s Australian made and owned and cruelty free, which are important things to me when I’m buying these sorts of things. The only problem I have with it is that it sometimes flakes when I brush it out. Speaking of brushing it out, I really don't have much of a method to that. I just keep brushing until it's smooth enough for what I want. I sometimes brush sections over the back of my hand to shape it a little and it helps to smooth it, too. If I leave them in overnight - and when I do I always put on a satin night cap - when they’re rolled all the way up, my hair is a bit too curly but if they don’t have as long to set they tend to drop a fair bit more. I found the best way to gauge this for my hair was just to experiment. It all depends on how well your hair holds to curling as well as the length. My hair is reasonably long - the longest part reaches just to wear my bra sits at the back - and heavy, too, but it takes to curling pretty well. And for anyone who is curious about the shape of my haircut, it's basically just cut into a 'U' and there's one layer which is a couple of inches shorter than the length. I really ought to have taken a photo of my hair unstyled - if anyone is interested, let me know. The only other thing I really need for my usual set is hairspray - I'm the kind of gal who isn't really happy unless my hair starts getting towards being crunchy but I'm just paranoid. I would suggest using as much or as little hairspray as you are comfortable with. I often like to pin the right side up and let the bulk of my hair hang free on the left. Is there any particular style you've seen me sport that you'd like to see a tutorial of? And do you prefer videos or just pictures? I must admit, I'm a little shy of filming myself but it is a lot easier to follow a video than pictures. Also, anyone who hasn't seen Fleur's tutorial on her faux bangs should go watch it now. It's very helpful and straight forward! 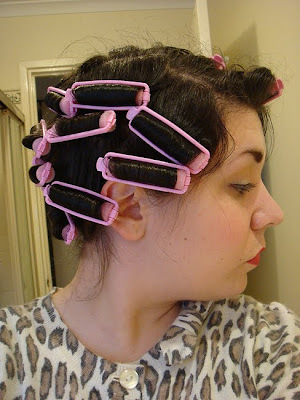 I hope this has been remotely helpful - if not, you get to see me looking ever-so-charming in my curlers! Hurrah. I hairspray my hair so it is not only cruncy- it wont move in a tornado! I find it is the only way to keep the curl all day. 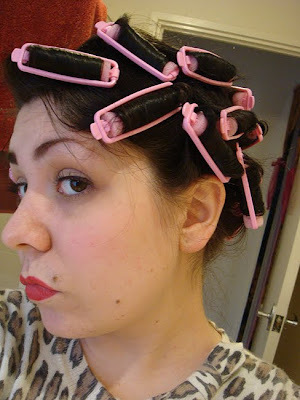 ps: I am currently wearing my curlers as I type this! LOL! I used those types of rollers for a long time, but got annoyed with sleeping on them! Nowadays it's mostly pincurls for me. Is your hair naturally dark, by the way? I hope you don't mind my saying so, but I think you have a nice profile. It seems to remind me of an old actress, but I can't put my finger on just who at the moment! thanks for the tips, gorgeous! You asked where to get gelatin free jelly. Well I couldnt find it in powder form at the supermarket so I got actual gelatin-free jelly cups and melted them ;) otherwise it can be ordered in powder form from the cruelty free shop online! 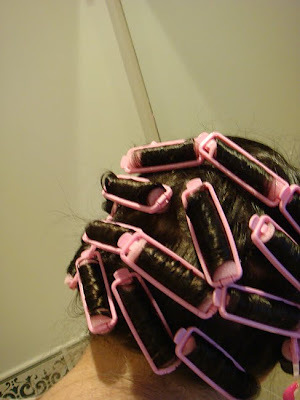 I have to say ive never seen those rollers youve used in your hair before. I usually use a curling iron, but of course mine turnes out quite different too because im not sure of any other way to do it lol. I imagine it would take ages to dry? or do you put them in when your hair is just damp? I did watch flurs video, her hair always looks great too! It would be great if you did a video but if you dont feel comfortable doing it you could do just a photo one first. oh and swing classes sound fun. Do they have beginners classes? 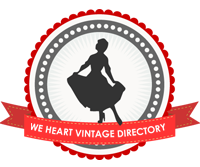 I had no idea you could do swing dancing on your own! I thought you needed a partner. I will have to try this! I always love your hair, and sponge rollers aren't painful to sleep in. your hair looks great! I've been following your blog for a few weeks now and it's very inspiring. do you mind taking a picture of your hair unstyled please so I can see the haircut?